Additional Notes: This sweet young boy was found roaming near the Big Red Barn along Hwy 105 at Hwy 7 outside of Baddeck, NS. This dog is in the care of the local, South Victoria, Animal Control Officer. It seems to be a young, male that has recently been clipped… please share with any groomers that may recognize this dog. Thank you for your help. What do u do with unclaimed dogs. Thanks for taking interest in this dog. 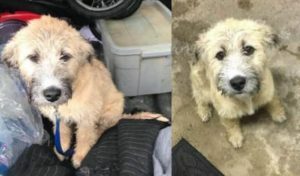 You would have to call the local Animal Control Officer (number listed in post) to find out details, but the general rule of thumb across the province is that dogs are kept for a minimum of 72 hours, after which if no owner has come forward they will go up for adoption. Some municipalities adopt out from their own Animal Control, others use local Shelters or the SPCA. They are all a little different. But all of Nova Scotia seems to be a No Kill zone, which means that dogs are not put down unless fatally sick or dangerous. Hope that helps!